Robert Whittaker’s interest in ecology emerged early; probably since when he first learned about Darwin’s finches in the Galapagos Islands. 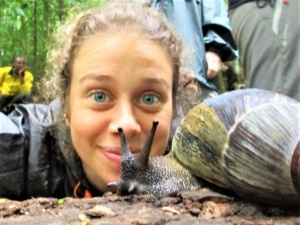 From there, it was a brief step until he started working on island biology, on the opposite side of the world, and on biogeography – understanding which species are where, a knowledge that can bring new insights to questions in ecology, evolution and conservation. Currently Professor of Biogeography at the University of Oxford, one of his major contributions has been to incorporate in this field the notion that islands are not static, geologically speaking: they are born, evolve, and then die, which leads to new predictions about island species richness. Island biogeography: in a very simple way, can we say that this research area corresponds more or less to the study of which species are where, in this case in an island? Please correct me if I am wrong. You can define it that way, yes. Another way to define it is to say that islands are model systems, so we can use the fact that there are many islands and they vary in their properties, such as area, isolation, the age of the island, human interference...all these are key variables that we know influence diversity and distribution of species. By selecting the right islands, for a particular purpose, we can use them to answer lots of different questions in ecology, evolution and conservation. And biogeography encompasses that space, really. And when did this research area began? I think you can probably say that Alfred Russel Wallace really defined the subject of island biology, when he wrote a book called Island Life [published in 1880], in which he drew together the observations as they were accumulated over the course of the 18th to 19th century, and he distilled the sort of main messages, rules, patterns that pertain to islands. Another landmark on this research area dates from the middle of the 20th century: the theory of island biogeography, by Robert MacArthur and Edward Wilson. Since it is a key element in the work you have later on developed, can you please explain in general terms the main elements of this model? Yes. Their model proposes that the distance of an island from a source of species regulates the frequency of arrival of new species to the island. The isolation thus controls the immigration rate: near islands have a high immigration rate, distant islands have a low immigration rate. And then there's the loss of species. The species don't stay put just because they arrive in a place, they don't stay there forever. The idea was that, if you imagine an empty island filling up with species by this immigration process, it comes a point where the amount of resources available to each new species that arrives becomes less and less. So some species have to start going extinct. Not necessarily late arrivals, maybe early ones. But there's going to be an increase in extinction as the island fills up. In the MacArthur and Wilson model, they say that the smaller the island the quicker it fills-up, and the higher the rate of extinction. And the larger the island, the lower the rate of extinction. So they propose that you get a balance: species over time arrive and other species go extinct. There's a lot more behind it, but their model had this very simple form and they expressed it in a very simple, graphical model, which is very easy to communicate. It has a tremendous value in teaching, because people can see why the system should be dynamic and why it should produce a predictable pattern of richness across a set of islands. That idea has turned out to be very productive. It allows you to generate lots of different predictions about how island life should behave, and it made people think in a more quantitative way. Prior to that, people had tended to look at island systems and how they behave in sort of historical terms, but not really thinking about this idea that they should be continually changing in their make-up. That was the idea that was really new and generated lot of research. It allowed scientists to predict patterns people didn't know about before, and could be tested comparatively easily. Meanwhile other biologists were studying lots of other things going on on islands, such as how a bird species arrives somewhere remote like the Galapagos Islands and develops over time into an array of different species. The adaptive radiation of Darwin's finches, for example, which is certainly taught in my country in highschool as a classical example. But...the MacArthur and Wilson model didn't work so well for really remote islands, right? The simplest way of describing this is as a conveyor belt: the plate moves over a hotspot in the mantle, the hotspot is producing magma plumes which build up and create an island poking above the ocean surface - and don't forget the oceans are really deep when you get to the middle of the Atlantic! [laughs] Then, over time, the plate continues to move and takes the island away from the magma plume. The island eventually begins to erode and it also sinks because of the weight of the mass on the crust, and then another island is forming behind it over the magma hotspot. So you've got a sequence of islands forming, moving away, eroding and subsiding. They go through a life span, to which we've given the label ontogeny: it's a technical word, but it just means that they go through birth, maturation, and then senescence - they disappear. 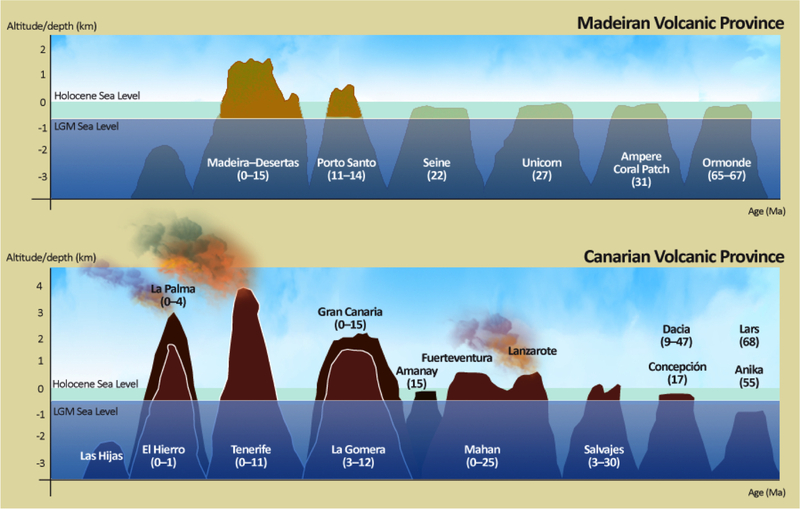 An example of the representation of the various stages of island cycle, in this case for the Madeiran and Canarian volcanic provinces. 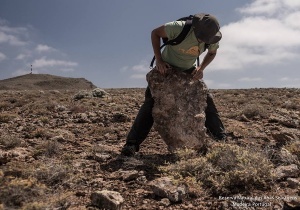 Color version of the imagE from the paper “A reconstruction of Palaeo-Macaronesia, with particular reference to the long-term biogeography of the Atlantic island laurel forests”, J. Biogeogr. (2011), 38, 226-246. Special thanks to José María Fernández-Palacios, and Robert Whittaker, for the authorization to use this image. Our model simply put those three things together and generates some new predictions. And I think what is proved interesting about it is that it has pulled together people who are doing research in both ecology and evolution. Because we're making predictions that you can test through looking at distributions of species on islands but also by looking at the evolutionary lineages. Can you explain your model, the General Dynamic Model [GDM], in more detail? Well, the model says this: when an island comes out of the sea, to begin with it's a bare volcanic cone, so it takes time for species to build up an ecosystem. Initially the rate of immigration from an older island nearby will be quite high, and it declines through time because there aren't many species in that area nearby, on land. Processes of speciation start taking place to fill the vacuum, and diversity increases. But islands can only support so many species. There's a limited amount of area, of diversity of habitats and nutrients, so you can only have so many individuals and they have to be distributed accross all the different species that have arrived and evolved. So there comes a point at which the island starts to decline and come back into the ocean, and the extinction rate - which we already know is largely linked to how big the island is - is going to go up. At some point the diversity must reach a peak and start to decline again, and as it declines the space for new species to be created through speciation becomes more and more limited. So, it's really predicting in its simplest that species and diversity of the endemic forms follow a very simple pattern. And lots of other things we can test follow from that. Can you give an example of a particular case that has already been studied in the perspective of the GDM? Yes, the GDM predicts that the proportion of species that are endemic to a single island should show a hump-shaped pattern over time. And tests for the Canary islands and for other archipelagos like Galapagos and Hawaii show that this model predicts the data very well. We also expect that, on the whole, species that arrive earlier in an archipelago will diversify and move down the island chain. Each time they reach a new island there's an opportunity to speciate, and on older islands speciation rates should slow down. And this has been looked at in a number of studies of evolutionary biology. While I was researching for your interview I read in a biographical sketch of yours that you have "a thing for islands". Were you always interested in this research area? What interests you more on islands? Well, I was always interested in ecology. But I guess my starting interest was the Galapagos' finch example in highschool: something that really grabbed my attention that was island specific. Then, while I was at the university, I had the opportunity to join part of an expedition to go to the Krakatau islands in Indonesia. They're very famous because in 1883 they had a huge eruption there, which displaced about two thirds of the land area into the sea and unfortunately caused a large tsunami wave. About 35 000 people were killed. This huge natural disaster attracted a lot of scientific attention. Within that, biologists started surveying the recovery of the ecosystem and it became a test system for MacArthur and Wilson's island biogeography theory. 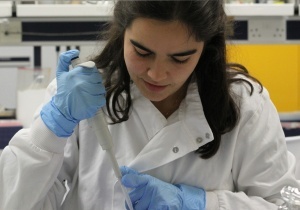 So I went as an undergraduate on an expedition to re-survey the plant diversity, to see if it fitted the prediction of what should happen over time. And that really spanned my interest in islands. Afterwards, after I had graduated and done my PhD (which was on arctic alpine succession) and got my first academic position, I and some of my colleagues from my undergraduate expedition decided that we needed to go back and finish the job, do some more research there. So I worked on Krakatau for many years: from 1979 through to 2002. Then, around that time, I felt I needed to be doing something that was less hard on the knees [laughs] and branching out into a broader view. In fact, I wanted to know how did my system fit into island biogeography theory. I ended writing a book about island biogeography [Island Biogeography: Ecology, Evolution and Conservation, 1st edition dates of 1998], and when you do that you realize there's always unanswered questions. At some point, I got to know particularly José María Fernández Palacios, who's in La Laguna University in Tenerife, and Paulo Borges, from the University of Azores, and we began to work together. 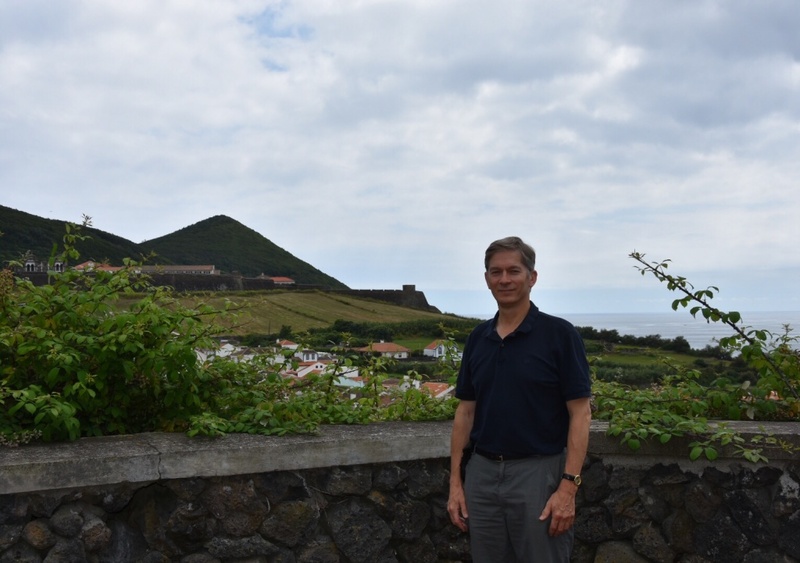 Paulo Borges has this wonderful research line based on studying invertebrates of the Azores and I began to collaborate on that, and with José Maria Fernández Palacios I began to work on the Canary Islands. In time, all this led to a number of research interests, and amongst them was the General Dynamic Model, which we stumbled upon as an idea. You mentioned that in the process of writing one of your books you stumbled upon several unanswered questions. To wrap up, I was wondering: what do you see as the next challenges on this area, some of the most challenging unanswered questions? There are lots of hugely interesting questions in island biology. 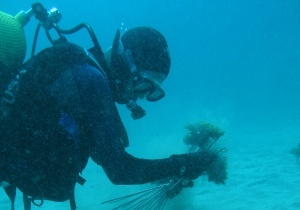 But really the most pressing questions are how to look out after the island biodiversity we've got. Island species and ecosystems face many threats and pressures due to habitat change, land use transformation and interactions with species from other parts of the world that have been introduced to the island. Now, over the next decades, climate change and all of these factors are driving species populations down and endangering many island endemic species. So, the biggest challenge is working out how to conserve island biodiversity and, to do so alongside the needs of human societies living on islands. They need to have a sustainable economy, good living standards and so on. 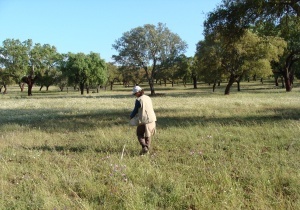 They need to use their limited resources for other purposes than just creating nature reserves. There's a lot of challenges there, and I think those challenges are the most important ones that island biologists need to keep in mind. It's great to work on pure science questions, which I do most of the time, but it's really important that we also think about how to work with politicians, how to encourange island people to learn about their biodiversity and to understand why it matters to them. Robert Whittaker was plenary speaker of the international congress Island Biology 2016, organized by the Azorean Biodiversity Group - cE3c.